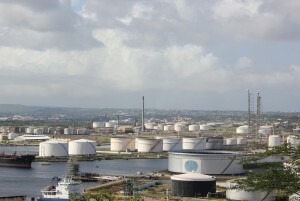 CARACAS, WILLEMSTAD - Moody’s Investors Service has downgraded Venezuelan state oil company PDVSA amid mounting speculation of an imminent corporate default. Moody’s lowered PDVSA’s bond credit ratings to ‘Ca’ from ‘Caa3’ and also demoted the company’s baseline credit assessment (BCA) to ‘ca’ from ‘caa3,’ the New York-based agency said on Tuesday. The firm’s outlook remained negative. On Friday, PDVSA failed to make a US$1.2bn payment on its 2017N bond, as the company sought to restructure some of its US$60bn debt to creditors. “The rating action reflects the payment default on November 2nd, related to the 2017 notes, and Moody’s expectation that the company will default on other debt obligations in the near term given its significant financial stress and the government’s stated intention to restructure its debt,” Moody’s said. Venezuela’s debt burden, which has been heightened by a three-and-a-half year oil price downturn, has forced the government to print more money, leading to runaway inflation and severe product shortages. The government and PDVSA will owe around US$1.6bn in bond service and late bond interest payments by the end of the year.